5 hours after carelessly trashing my 13,592 photos in iPhoto, I was finally back up and running. For anyone out there who uses iPhoto, if you're ever tempted to go inside the iPhoto Library folder and move things around, DON'T. Just say no, turn yourself around, and go do something else. Because "harmlessly" moving things around will cause it to believe that there are NO photos there, as opposed to the 13,592 that you know are there. I was quite amazed at myself, I managed to call tech support and converse in a normal voice, no panic, no tearing at hair. I'm guessing it's hard for them to understand what one is saying when one is sobbing like it's the end of the world. So I didn't do that. Actually, it wasn't a painful recovery process, it just took a little while. And granted, that 5 hours spanned dinner/bath/story/bedtime, so while it's 5 hours on the clock, the actual time spent was probably more like 1 or 2 hours. That's not too bad. I've said it before, and I'll say it again: BACK UP YOUR COMPUTER. That's why it was so easy, because I had a recent backup. It would also be good to do a backup before doing something major like installing a new version of software, but that would have cut my 5 hours down to 5 minutes, and where's the challenge in that? 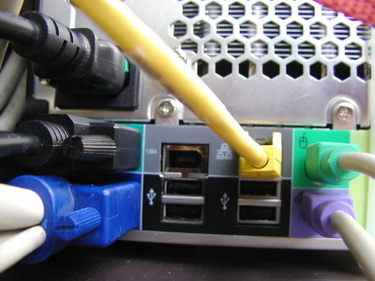 It's not just the computer that's back up and running. It's also me. November (and the last half of October) has been a difficult month for me. It turns out that my thyroid went out of whack and I was quite a bit hypo. Then my heart started to act up. MY HEART. Palpitations. My doctor said it was nothing to worry about (NOTHING TO WORRY ABOUT? IT'S MY HEART, NOT MY HAIR), but sent me to a cardiologist anyway. My cardiologist said it was nothing to worry about but hooked me up to a 24-hour EKG anyway. The results came back--it was nothing to worry about. It's suspected that my thyroid wackiness was causing the heart wackiness. Anyway, it's better now. This morning I went to the physical therapist for my neck. I love Celeste, she's a miracle worker. The shooting pain up and down my back is gone, and I can turn my head more than I've been able to in days. I go back for another visit tomorrow, and then a few more next week. I know I'll be back up and running in no time after another visit or two with Celeste. In the meantime, I've been slow to respond to emails & voice mails, slow to mail out promised photos on CD (Judy), slow to get together with my artist group, work has been...oh, I'm not even going to think about work. So if you're waiting for me, thank you, and I'll get caught up soon. 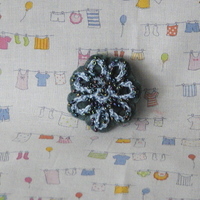 This weekend was a fun time, a whirlwind of sewing during which felt, beads, and thread flew every which way. Here are some of the results. I've just posted a bunch of these to my shop. It's a big update for me, as I usually list just one or two things at a time. 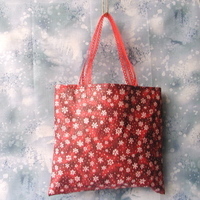 I've also got some tote/gift bags to put up, those will be up later tonight. But now it's time for dinner. Everything is up now. Here are a few shots by my apprentice photographer, Max. He setup and shot each photo (and many, many more) all by himself. 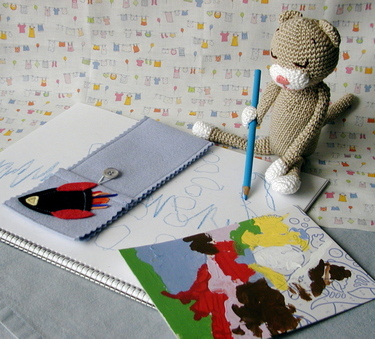 Occasionally he would employ me to be his assistant, I thought it was very cute. 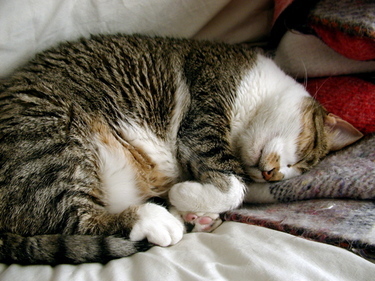 Here's what I wish I were doing right now. Lying on the couch in the sun, taking a nap. Like Gertie. Instead, here's what I'm doing. I'm at work, putting together some documentation and making sure I understand this instrument/computer system. Which is a good thing, but I'd rather be napping. Suddenly this weekend I was seized by the desire to make pins. Does that ever happen to you? I don't know where it came from, I was happily working away on bags when bam! Must make pins. 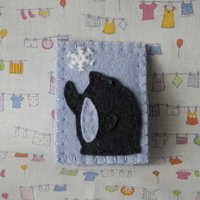 My first was similar to this first pin but with some issues: too large, too floppy background; too much blanket stitch making things too busy. This was my second attempt, I like it better. Can you tell that I'm anxious for snow? 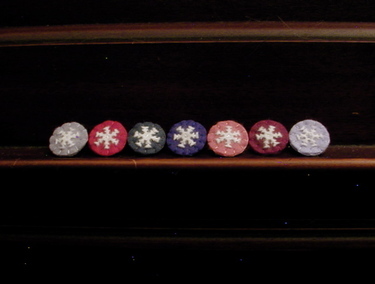 These I made tonight, a simple snowflake on a circle background, in a variety of colors. I hope everyone had a good Thanksgiving! We went over a friend's house, the kids played wonderfully and we all had a wonderful time. Friday I sleepwalked out of bed and over to Michael's for the early morning sale. It was 8:30am by the time I managed that, so it doesn't qualify as early when compared with everyone else who was out and about, but it was early for me. Later in the day we went to see the alpacas. Of course I had to buy some yarn! But I did show great restraint, she offered to get out the fleece to show me, and I said no thanks. Don't worry, I'm planning to go back later to look at the fleece! 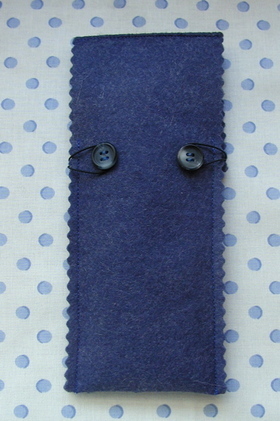 I love the feel of wool felt and it's so wonderful to work with. 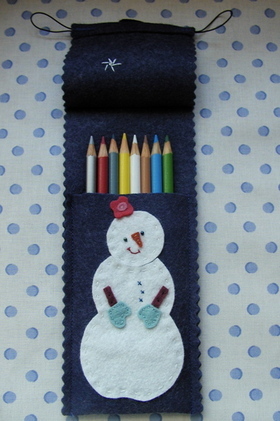 My plan for Christmas presents includes lots of pencil cases, so I'm working on designs now. Some will be available in my etsy shop this weekend, I'll let you know when they're up. 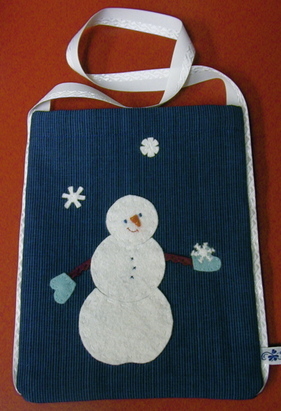 I'm also making some to send with a friend for her craft show table. 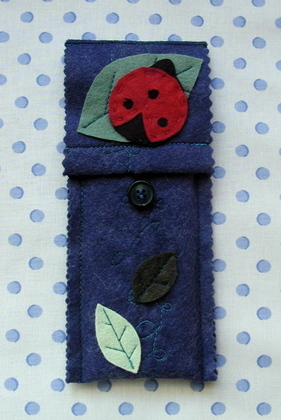 The ladybug design I've used before, but this time I added leaves on vines--using my new free-motion quilting skills (if you can call it that) for the vines. 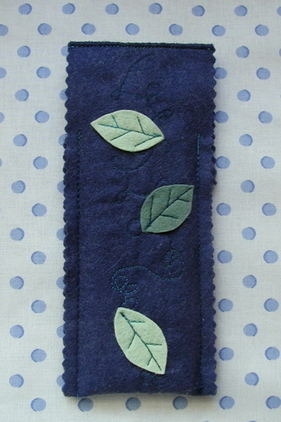 I also changed the closure, I didn't like cutting right through the middle of the main design for the buttonhole. I like the loop & button better. 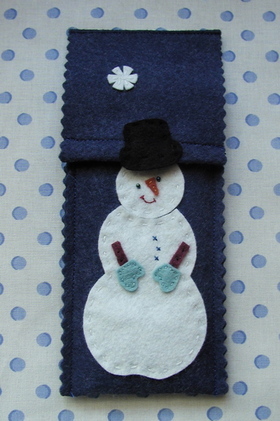 The snowperson I've also used before, but this time I added a hat on the top flap. 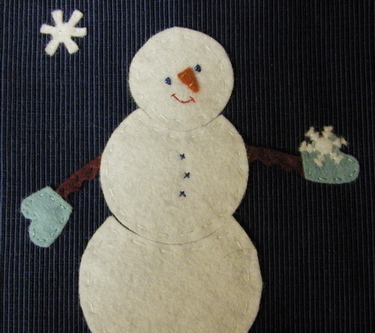 I was going to split the snowperson, and have the head be on the top flap while the other two snowballs were on the bottom. But then it felt not-quite-right to rip off the head each time the pencil case was opened. So I moved everything down and added a hat. Much less violent! 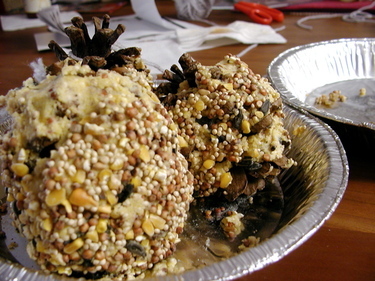 A few weeks ago, Max and I made pinecone bird treats. We've had them in the freezer since then, and are pulling them out one by one to hang on the trees outside. Below are the "cake" form, made by pushing into a cream cheese tub. I put a stringing hole in by pushing a straw through before it was solidified. But this didn't work too well. As soon as the cake warmed up enough, the hole split and the cake fell to the ground. We stuffed it into the crook of a tree, but overnight a racoon or some other animal must have taken it because it was gone with only claw scratches left on the tree. And here's a red-shafted flicker, quite an acrobatic fellow! 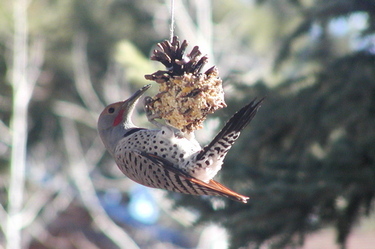 He hung on for multiple minutes, cleaning out the treats that he could reach, all the while rotating on the pinecone. 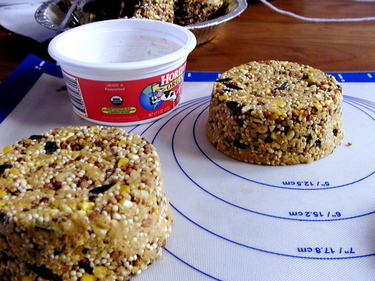 To make these, we mixed approximately equal parts suet (or chunky peanut butter), yellow corn meal, and bird seed mix. Stir it all up, then pack it into the pinecone wherever you can. If pinecones are closed, you can toast them for a bit in the oven to open them up (~200F, 30 minutes). After these are filled and tied with string, I put them into little baggies, tied at the top, and popped them into the freezer. The flicker's pinecone is our fourth in about 2 weeks. The birds took a little while to find them, but now they're visiting them regularly. Today was the first time I saw the flicker. Before him, it's been mostly chickadees getting a snack. This makes good "kitty TV". The pinecones are just outside the big, sunny bay window. The cats love to sit in the window and do their weird little chatter at the birds. Like the birds are being fooled by any of this! I made these this weekend--yummy! 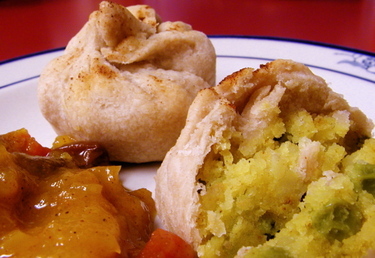 I lovelovelove samosas, but the recipe from my favorite Indian cookbook takes forever to make. These are from a new cookbook I received last week, Vegan Lunch Box, from the blog of the same name. These were so easy to make! I made the dough while the potatoes were cooking, then everything went together very easily. And how did they taste? Delicious! Granted, the flavors were not as complex as other recipes, but "complex flavors" usually means Max won't eat it, so I'm more than happy to give up a few complexities. I also tried the recipe for empanadas from the Vegan Lunch Box, but I used some baked chicken I had leftover as part of the filling. These were a huge hit with Max, he didn't talk during dinner, just ate his empanada. That's a huge endorsement for our little not-interested-in-food boy! We're not vegans or even vegetarians, but we usually eat not too much meat. I'm planning to make a whole bunch of the recipes from this book, some as is, some with substitutions. Let's face it, it's much easier to add the dairy/eggs/meat back in than it is to take it out in the first place. We'll probably end up eating even more veggie meals, at least for a while, because I want to try so many of the recipes in this book. I think that's a good thing. There's just one house rule: we don't ask Max to give up his cheese--he's a cheesatarian! The pear chutney is from the bumper crop of fruit we had in town this summer. I got buckets of pears from friends and neighbors and made up some jars of chutney. Very yummy! The recipe is here, instead of the mangoes and apples I used 4c of chopped pears. 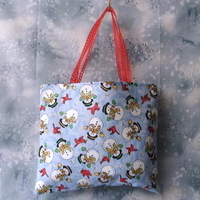 My project for today: a little snowman tote bag! I had in my head an idea that he would be sticking out his tongue trying to catch a snowflake, but the reality of trying to achieve that forced a slight change of plans. 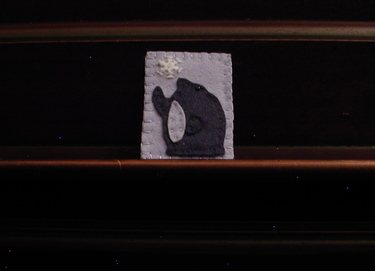 He's still eyeing a snowflake, but this one is caught in his mitten. 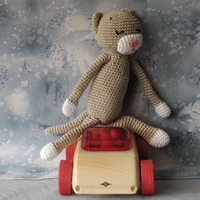 I've used Lion Brand WoolEase for all the ones I've made so far. It's my standard cheap, let's-try-this-pattern-and-see-how-it-works yarn. It worked so well (def: nice and warm) that I kept using it. There's not a ton of padding on the sole, just the 2x2, so if you're used to shoe-like slippers these may not be for you. 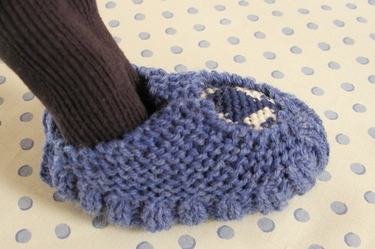 But I'm used to barefoot in the house, with wool socks in the winter, so these are great for me. And hopefully they'll protect my wool socks so the bottom won't wear through like they just did on my favorite pair of handknits (sob). Here's how I use those numbers in the pattern. 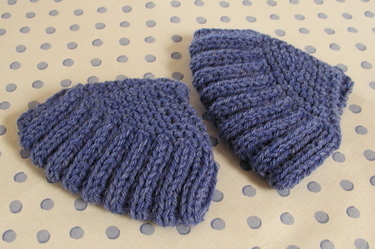 I knit "A" rows of 5-stitch garter stitch, then increase to "B" stitches. I double those to get a total of "C" stitches (still in garter stitch). Then do k2p2 rib for "D" inches. Then just reverse to finish. k2tog to get back to "B" stitches, decrease to 5 stitches, knit "A" rows of 5-stitch garter stitch, cast off. The largest ones take almost a full skein, and I think I can get more than 2 pair of the children's size out of a skein. I'm working on more for my parents for Christmas, plus I'm thinking of having some extras in a box by the door for visitors. Since we take shoes off in our house, but without carpeting it's really cold to walk around in just socks. The bottoms can be a little slippery because there's nothing sticky on them. I don't think you could use that puffy paint, since they stretch so much. I saw some clear elastic for sewing at JoAnn's, I wonder if that would help. In any case, we've all adjusted to them, so they don't feel slippery any more. Unless you WANT them to. Like Max, who likes to be pulled along the floor. Or who attempted to sprint to the front door: pitter patter CRASH "I'm OK!" pitter patter CRASH "I'm OK! Ha ha ha!" Max found some glass millefiori beads when we were in the craft store, and asked to have a bracelet* made out of them. OK, I can do that, I think. It turns out that he wanted to just wear the beads as they were strung on the plastic cord, but as I didn't discover that until I'd already removed most from the cord, hopefully he'll like this too. I used two colors of crochet cotton, blue (2 strands) and natural (4 strands), and a simple macrame knot all the way down the line. I think I may need to redo the loop closure, I suspect it won't stay on very well. We'll see. *Obviously we're attempting to not give in to gender stereotyping here. 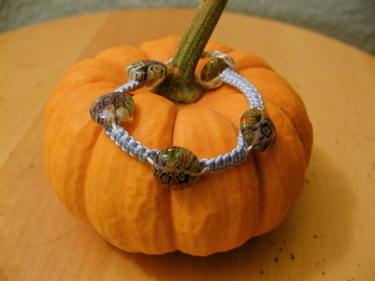 If he wants to wear a bracelet with pretty beads, then he can. That said, I did try to make it a little more masculine, if that's possible, by making it with what look (to me) like fishermen's knots.